Kindness Matters is a charming picture book in which friends work together to solve a problem. 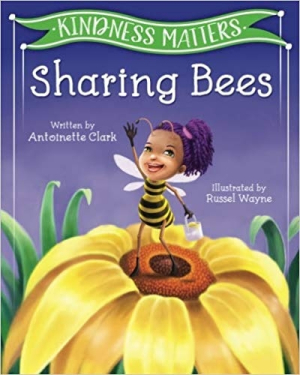 Antoinette Clark’s picture book Kindness Matters follows bees who are collecting honey to share with the rest of their hive. Sadie wakes up to the first day of spring, and she can finally go out with her friends and collect nectar from her favorite flower, the Orange Blossom. She loves pollinating the flowers and preparing the hive for winter. When the young bees see a White Clover, a favorite among the baby bees, Sadie asks everyone to collect its nectar in order to share. Things get rushed, and Sadie warns everyone that the rain is coming. They all have to hurry back to Honeycomb City before they get wet, and can only do so by sticking together and sharing the loads of pollen and nectar so that no one has to carry too much. Everyone makes it back safely and Sadie shares the White Clover with the baby bees. The story teaches about bees and their processes and delivers a lesson on sharing. Its setup pays off thanks to a satisfying ending. The story is clear and fun to follow, though it takes a while to arrive at the challenge of the rain. It is a bit too on the nose that Sadie so perfectly exemplifies kindness. Sadie’s friends are able to listen to her as she explains how to solve their problem, but their readiness dilutes the potential conflict. The text is clear, but its lack of drama impedes its progression. Russel Wayne’s illustrations are colorful and diverse. Characterizations are consistent throughout, depicting human heads on bee bodies, a unique and unusual mashup that becomes more comfortable as the book progresses. Each bee’s expressions and actions are well represented. The bright images enhance the storytelling and convey messages about sharing well. Kindness Matters is a charming picture book in which friends work together to solve a problem by putting the needs of others ahead of their own.